When I meet Siddaramaiah in Bengaluru, he is minutes away from officially announcing his decision to contest from Badami in north Karnataka (in addition to the Chamundeshwari seat in the south). Any suggestion that this may be construed as a sign of anxiety visibly irks him. “Was Modi nervous when he contested from Gujarat and Uttar Pradesh in 2014? Answer that before asking me about two seats,” he shoots back. “I did this because the people in the north want my presence there.” His aides tell me that when the decision was still being hammered out at internal meetings, any suggestion that this could be perceived as an example of his confidence wavering made the Karnataka chief minister angry and insist that he would rather stick to the single seat of Chamundeshwari. Eventually, he was persuaded. Despite excitable murmurs that Badami may see a contest of chief ministerial candidates if B.S. Yeddyurappa were fielded, the BJP is finally being represented by B. Sriramulu, a close associate of the Reddy brothers, the controversial and scam-tainted mining barons of Ballari. For Siddaramaiah, who spent many years of his early political life taking them on, the decision triggers a sense of déjà vu. “The Reddy brothers are back again to loot Karnataka,” he says. Let Modi come 100 times. I am not worried. The BJP has revealed that it has no strong state leaders. That’s why these north Indian imports. There is no Modi wave here. No question. Never. The question does not arise. People know Deve Gowda and the BJP are supporting each other. We will not need Gowda. I’m not an atheist; I am a Hindu and a humanist. I am Hindu and an Indian. I am a Hindu who stands for human values. The BJP stands against human values. Amit Shah calls me a non-Hindu; but he himself is a Jain. Let Amit Shah deny he is a Jain. Was Modi nervous when he contested from Gujarat and Uttar Pradesh in 2014? Answer that before asking me about two seats. Yeddyurappa is the most corrupt politician. The BJP has retired [L.K.] Advani and [Murli Manohar] Joshi because they are over 75. So, why the exception for Yeddyurappa? Siddaramaiah is counting on Badami being a stronghold of his own Kuruba community (55,000 of the 2.5 lakh voters), while Sriramulu is banking on the endorsement of a section of the scheduled tribes, as well as the vote of the Lingayats, the community to which Yeddyurappa belongs. Perhaps the biggest and most audacious political gamble Siddaramaiah has taken is for his government to recommend that the Lingayats be recognised as a separate religious minority. Lingayats make up a fifth of Karnataka’s 6.5 crore people, and have traditionally supported the BJP. Siddaramaiah’s surprise move was aimed at flummoxing the Modi government (it is up to the Centre to take the proposal forward) and make a chink in the BJP armour. So far, the party has responded by accusing him of trying to “divide Hindus”. What is true is that Siddaramaiah has challenged superstitions; not just by attempted legislation, but personally. As state finance minister, he presented his budgets during the supposedly unfavourable period of rahu kaal. Despite a widely held belief that whichever chief minister visits the so-called ‘unlucky’ city of Chamarajanagar ends up losing power, Siddaramaiah has gone there multiple times. More than religion and ritualism, Siddaramaiah has made regional identity the core of his campaign. If Gujarati asmita was the defining characteristic of Narendra Modi’s politics while he was chief minister, Siddaramaiah has focused on Karnataka pride. He ordered that Hindi-language posters be taken down from metro stations in Bengaluru, has advocated for an official state song and perhaps, most contentiously, a separate flag for the state. When I ask him whether he is not setting a dangerous precedent,—after all, every state could start demanding the same—he is unwavering. “A state flag for Karnataka does not undermine the sovereignty of India in any way,” he says. “Where in the Constitution does it say this is not acceptable? As for language, I am not anti-Hindi, but I will push for the supremacy of Kannada. The reorganisation of Indian states was on the basis of language. And, the Centre cannot impose Hindi. That is what we are against.” This emphasis on regional and linguistic sub-nationalism is perhaps the chief minister’s strategic counter to the Modi government’s focus on muscular nationalism and Hindu consolidation. Siddaramaiah—a self-described socialist—is counting on his welfare schemes to win him votes in rural Karnataka. A universal health care programme, and free rice and free milk subsidies are his big-ticket showpieces, policies that he says emerged from his own humble origins. He grew up in Siddaramanahundi village, 23km from Mysuru, and used to graze cattle as a child; he was enrolled in school only from the fifth class. 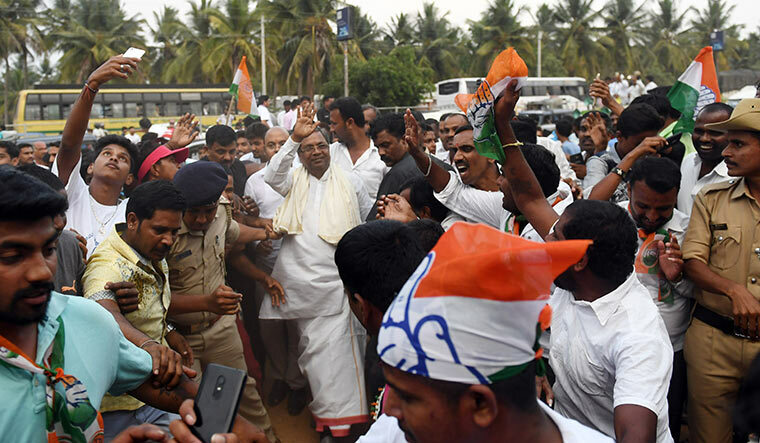 While his rise has been remarkable, today he shoulders a national responsibility; a defeat in Karnataka could mean an existential crisis for the Congress and a morale crusher in the run-up to the 2019 Lok Sabha elections. Off record, his team tells you that there are still concerns about some dissension in the ranks from leaders like Mallikarjun Kharge and Veerappa Moily, who feel marginalised today. But, if anyone can deliver a second term to the Congress, it is Siddaramaiah. He is the first chief minister in 40 years to complete his five-year term, and is clearly much more popular in the state than his party is.